The first deployment of the Task Force in January 1968 was on Operation Coburg. 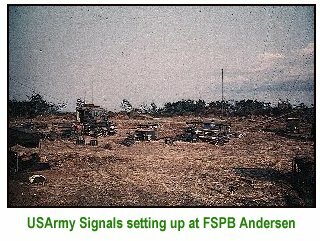 The Task Force HQ was estabished at FSPB Andersen near a rubber plantation on Highway 1, astride a well-known enemy route and was easily observable by the Viet Cong by day. 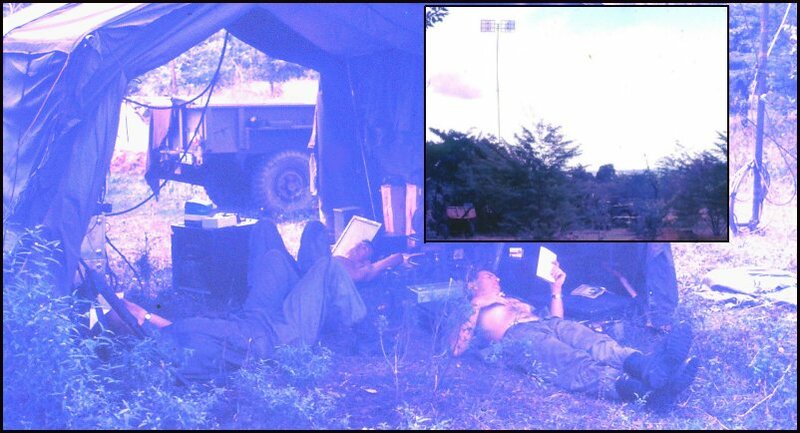 Throughout the operation the usual Task Force communications nets were estabished including the Command VHF Net and various links to the Task Force base at Nui Dat and the higher operational command, II Field Force Vietnam at Long Binh plus other adjoining units. US Signals were to provide the Radio Relay (RR) links to Long Binh and Nui Dat but suffered from numerous equipment breakdowns and appear to only have inexperienced technicians and operators available. After four days the Task Force Senior Signals Officer Major Norm Munro, OC 104 Sig Sqn, recommended that an Australian RR (Radio Terminal Set AN/MRC-69) be deployed. The deployment of 110 Signal Squadron's last RR Field Shelter resource stetched equipment reserves to breaking point, one fault in any location would have disrupted the whole system. 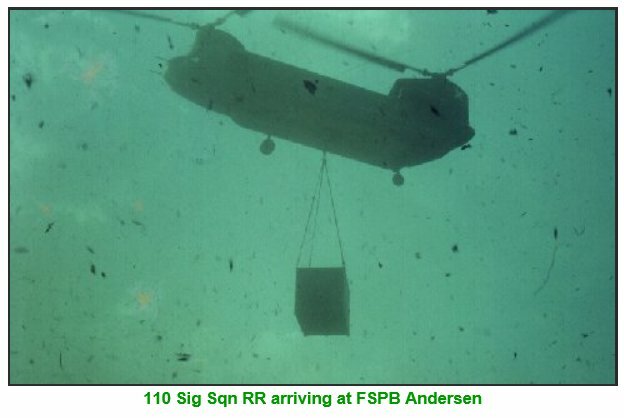 The AN/MRC-69 arrived under a US Chinook. The starting effect of the downdraft of the twin rotor helicopter as it deployed the shelter to a prepared scrape was a new lesson for all. It demolished the signal centre (moved the SB-86 switchboard three feet and disconnected many lines, upturned a table and smashed a teletypewriter) blew the Task Force RAP tent 40 feet away and left the medical officer sitting bewildered in an open scrape amidst his smashed bottles, and wrecked the 104 Sig Sqn OC's tent. The Command Post remained intact only because every Soldier/Officer available held down the tent. The scene afterwards resembled the aftermath of a Tornado and it became very important that the Australian RR provided the service that had been promised by RASigs. It did !! Lesson 1: Chinook deployments of communication equipments should occur before other facilities are setup. Lesson 2: Avoid using US Army Network for Australian internal communications to ensure control over the restoration priority. The 110 Sig Sqn RR Detachment members were Cpl Carl Pender, Sig Dave Shales, Sig John Holdsworth and Sig John MacDonald along with the Sgt Garry Martin (RR Sgt, 704 Sig Tp, 110 Sig Sqn) as liaison during the setup. Operation Coburg appears to be the last time the RR Shelters were airlifted in South Vietnam as the next time RR was used was Operation Toan Thang at Bearcat and during the Battle of Coral Balmoral. They were transport by road on Operation Toan Thang and all future operations in South Vietnam. The first airlift of the AN/MRC-69 equipment was by 145 Sig Sqn (506 Sig Tp), in support of 103 Sig Sqn/HQ 1ATF, for Operation Hayman to Long Son Island in Nov 1966. 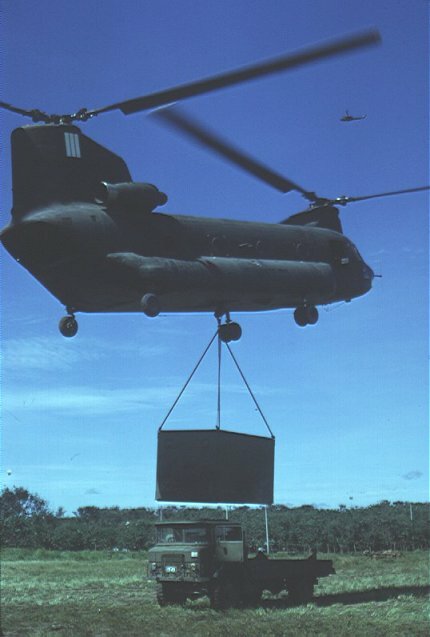 The equipment was dismantled from the AN/MRC-69 shelter and just the Radio Set AN/TRC-24 and the Telephone Terminal F1830 (and other bits) and were airlifted in by US Army CH-47 Chinook. 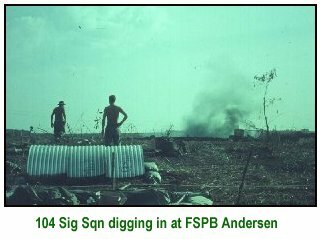 The only other air deployment of RR in South Vietnam appears to be on Operation Kenmore to FSB Spear in Sept 1967 in support of 104 Sig Sqn/HQ 1 ATF. The Detachment Commander was Cpl Carl Pender but other members are unknown. 110 Sig Sqn Radio Relay Shelter (AN/MRC-69) being deployed on Op Kenmore.